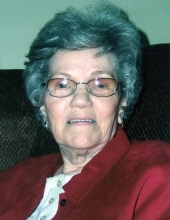 Mrs. Betty Jean Coalson, age 89, of Rockmart, passed away Sunday, February 10, 2019. She was born in DeKalb County, AL on June 23, 1929, a daughter of the late Elbert Bethune and the late Ethel Norris Bethune. Mrs. Coalson lived the greater part of her life in Rockmart where she was a member of the Piedmont Avenue Baptist Church. Mrs. Coalson enjoyed working in her yard and she loved her family with all of her heart. In addition to her parents she was preceded in death by her husband, Cecil Wayne Coalson; four brothers: Jesse Bethune, Carl Bethune, Dewey Bethune and Hoit Bethune; and a sister, Letha Mae McGarity. She is survived by her three sons: Gary Bailey and his wife Jan, Villa Rica, Danny Bailey and his wife Lynn, Rockmart and Greg Bailey, Woodstock; seven grandchildren; fourteen great grandchildren; three great great grandchildren; two sisters: Jeanette Peek, Fyffe, AL and Willene Blackmon, Calhoun; a number of nieces and nephews; and a loyal neighbor and friend, David Childers. Funeral services will be held Wednesday, February 13, 2019 at 2:00 pm in the chapel of the Alvis Miller & Son Funeral Home with Joel Grubbs officiating and a granddaughter, Dana Streetman delivering the eulogy. Interment will follow in Polk Memory Gardens. Pallbearers will include: Jeff Bailey, Brandon Bailey, Alec Bailey, Zane Jay, Dylan Bailey and Collin Grubbs. Honorary pallbearers will include: David Childers, Jake Bailey and Chris Johnson. The family will receive friends Wednesday afternoon from 12 noon until the funeral hour at the funeral home. The Alvis Miller & Son Funeral Home is in charge of arrangements for Mrs. Betty Jean Coalson. To send flowers or a remembrance gift to the family of Betty Jean Coalson, please visit our Tribute Store. "Email Address" would like to share the life celebration of Betty Jean Coalson. Click on the "link" to go to share a favorite memory or leave a condolence message for the family.